Veteran rider Michael Rutter will contest the 2019 Isle of Man TT Superbike races aboard the Honda RCV MotoGP replica. The RC213V-S is a Honda road bike derived from its MotoGP challenger, and was ridden at the TT in 2016 and '17 by 13-time race winner Bruce Anstey with the Padgetts team - achieving a best result of eighth in the '16 Superbike race. 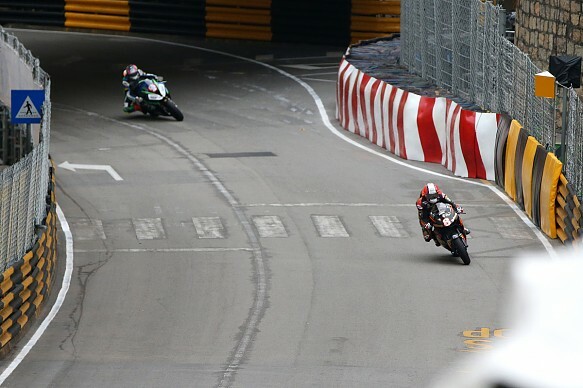 Rutter, who enters his 25th year at the TT in 2019, rode the bike in his Bathams colours at last year's Macau Grand Prix, finishing second behind winning team-mate Peter Hickman on the BMW S100RRR. Rutter said riding the replica at the TT had kept his motivation high ahead of the event. "We've got the RCV Honda, which is a very rare Honda bike, which is something a bit different," Rutter told Autosport. "That makes you go 'oh, that's good, can't wait to jump out on something a bit different like that'. "So you always have something to keep you motivated and keep you moving on. "It looks absolutely beautiful, and it sounds fantastic. Going off down Bray Hill, I can't wait to have a go on that." He admitted that his initial impression of the RCV in Macau last year was that it was "a bit slower" than Hickman's BMW - but put this down to going in the wrong direction with set-up and said it was "really good" overall. "I was really surprised, handling-wise the bike was fantastic," said Rutter. "I'd say actually it's probably a bit slower than Pete's BMW. "But it was very good in change of direction, where it's obviously lighter than the BMW. "I think we messed up a bit with the electronics and the gearing. So hopefully we can get a little bit more speed out of it so it can be as quick as everything else out there. "But it's just unique, the bike, and it's so nice to ride. Even if we are losing on a few different things, I'm happy to ride it just to ride it. "It'll definitely suit me more than probably the BMW would anyway, in the way it brings the power in. And it's just cool to ride."